Jimmie Johnson has debuted the new paint scheme that will adorn his No. 48 Chevrolet Camaro ZL1 for the 2019 Monster Energy NASCAR Cup Series season. The paint scheme consists of a gloss black base with a multi-tone pink and purple Ally livery laid overtop. Johnson’s signature highlighter yellow ’48’ has returned, of course, and is joined by a matching yellow decal of Ally’s tagline ‘Do It Right’ on the rear quarter panels. The new Ally Financial-sponsored car represents a departure from the Lowes-branded Chevys that many JJ fans have been accustomed to. 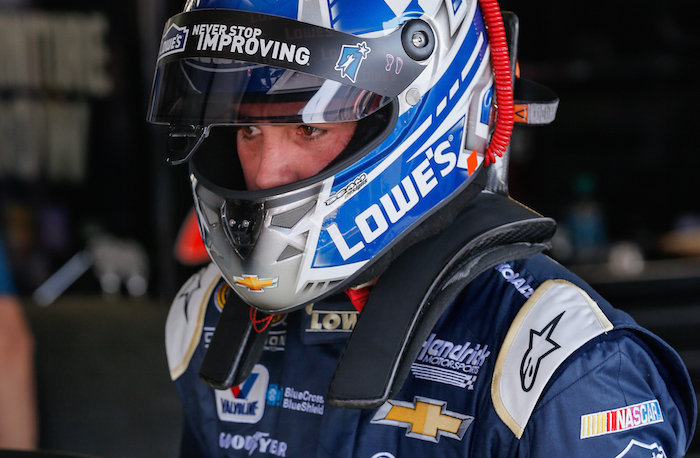 The hardware store chain announced it would not renew its sponsorship deal with Johnson and Hendrick Motorsports last year, with the No. 48 team finding a new primary backer in the way of the Detroit-based banking firm. “We wanted Jimmie and fans throughout the country to love the car, so we were ecstatic that he took such a hands-on approach to developing a paint scheme that would stand out and his fans would embrace,” added Ally marketing boss Andrea Brimmer. Johnson is contracted to race with Hendrick Motorsports through to the end of the 2020 racing season. After struggling in recent years, Johnson will be looking to put up some strong results as his contract begins to wind down. The 2019 Monster Energy NASCAR Cup Series will kick off with the 61st running of the Daytona 500, coverage of which will start at 2:30 PM ET on Sunday, February 17th. Not a bad looking car, even with the pink stripes. JJ’s probably a good guy but I don’t want to see him break Petty & Earnhardt’s record. Just having him “tied” is somewhat of an insult, as several of JJ’s championships are meaningless under the new points systems, in my opinion. I hope he wins some races though. You are a fool when it comes to JJ championships! JJ is the most impressive driver in the sport ever! He won one every single type of points configuration! Hope the Camaros are better than last year! Paint job will make it easier to find the 48 in the back of the field. LOL. I still prefer blue color. Ally was former GMAC. Nice to see JJ still hanging in there. But… when Lowes left. it was a sign JJ should have hung it up. I agree, to go after Dale’s and Richard’s record is not going to happen. A tie is as good as he is gonna get. Time for the “Young Guns” to have a shot. Seven is enough! Perhaps a sign but I’m pretty sure JJ already knew retirement was right around the corner anyway.. Lowe’s leaving had nothing to do with JJ though. Lowe’s is trying to get their own house in order. They’re closing unprofitable stores and putting their revenue into revamping the rest. If I were CEO, I’d do the same thing. Money needs to be re-invested into their stores and company right now, not Nascar. Priorities.